Most foundations, all technical buildings, both tower foundations and all radar socles remain of 'Seeadler' and therefore the location is still very recognisable. 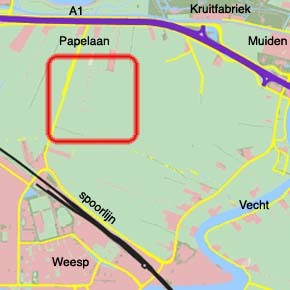 The station lies in the center of the Bloemendalerpolder between the towns of Muiden and Weesp and is in the municipality of Weesp. Until the border correction of Januari 1st, 2016 it belonged to the municipality of Muiden. You can see the constructions from both Highway A1 and the railway Amsterdam - Amersfoort. They are east of the old Papelaan (road), south of the farm 'Breedland'. On the maps displayed to the right you can see were 'Seeadler' is. 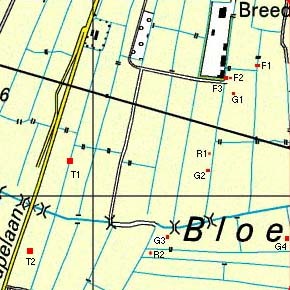 In the lower map the three foundations (F), four buildings ('garages', G), two radar socles (R) and two tower fundations (T) are marked and numbered. The radarstation was one of around 300 built in Germany and the occupied territories. There was complete coverage by radar above land. Along the coast where observation stations and along Germanies western border was a separate distinguishable Kammhuberline of stations. These were the eyes and ears of the air defence against the English and later Allied bombers who had the German industrial and housing areas as their target. Using anti-aircraft artillery and fighter planes the attackers were fought against. The radar stations were given a codename of which the first character was a reference to the nearest town. 'Seeadler' looks like an exception to the rule but possibly 'Adler' (eagle) is a reference to the city of Amsterdam and the prefix 'See' (lake) was because of the nearby IJsselmeer. A station by the name 'Adler' existed in Denmark. Similar stations in The Netherlands (name and town mentioned) were: Bisam (Strijbeek), Salzhering (Den Helder), Bazi (Rips/Bakel), Truthahn (Weert-Bakel), Eisbär (Sondel), Gazelle (Veendam), Gorilla (Schoonrewoerd), Hase (Harderwijk), Hering (Hoorn/Medemblik), Kröte (Goor) and Löwe (Marum). Also the later type of Y-tracking stations: Sneeglöckchen (Schagen), Teerose I (Terlet) and Teerose II (Roosendaalse Zand). These stations were known as Himmelbettstellungen which each could guide two fighters to two targets. The stations were constructed in three different ways for which the most extensive one had at least one Freya (FuMG 80) and two Würzburg Riese (FuSE 65) antennas. If located along the coast, a station also had a Fernstsuchgeraet (Wassermann, Elefant en Mammut) radar.